Stop for a moment and think about a big goal you have. Seem big? What if your goal was to employ one million people each year? Now, that’s big. And, that’s exactly the goal Express Employment set for itself. Getting started, I kept this impressive number in mind, knowing that a staff this size needed a place where they truly felt inspired. Integrating modern technology into the design was also key. As soon as the client described his vision as a “funky, tech-y place for millennials”, I knew this was the job for me. But, before we get to the fun stuff, let me show you what the space looked like before I got my hands on it. 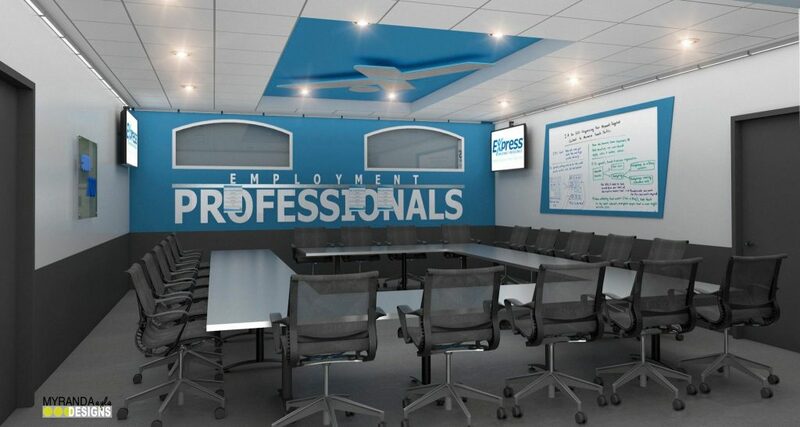 To get inspired for the design, I wanted to learn more about the professionals that worked at Express Employment. I imagined myself entering the space, professionally-dressed, determined and eager to learn. What would that space feel like? First, I knew that I wanted to use their logo as creatively as possible, making bold statements where I could. This team is so proud of their company and the hard work that goes into it, which is absolutely something that should be celebrated. I wanted to create a focal-wall for presentations using signage as a backdrop. I felt pulled towards monochromatic, contemporary materials, like concrete, stainless steel, and gray tones, paired with blue shades from their logo. A recessed ceiling in the space would act as another focal point for the space. Creatively integrating their logo again, this time with a stainless, ceiling-cloud contoured with rope lighting. 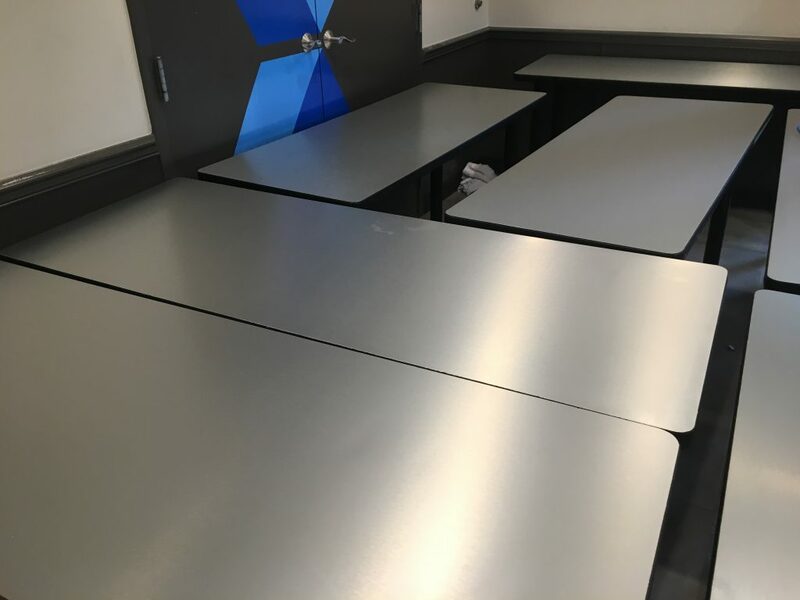 Stainless, collaborative tables would welcome creativity and fresh ideas. And, of course, nothing great can be achieved with fluorescent lighting. So, out with that and in with LEDs. 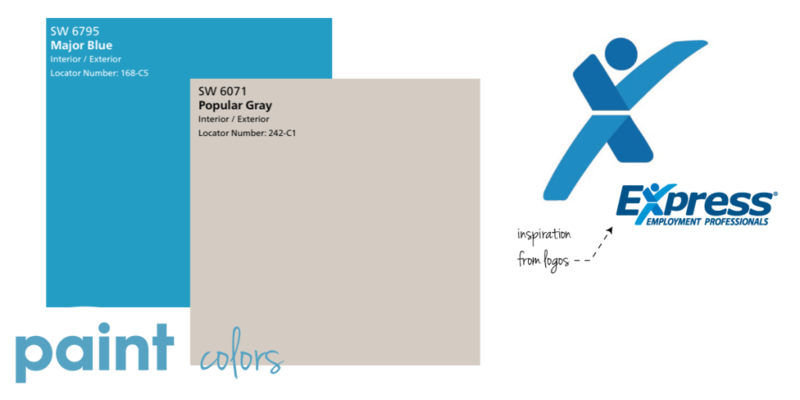 The walls were transformed using Sherwin Williams Major Blue and Popular Gray. All of the fluorescent lights were removed and replaced with 6” LED wall washers and cans installed with dimmers. We wanted to create a focal point with the central lighting. 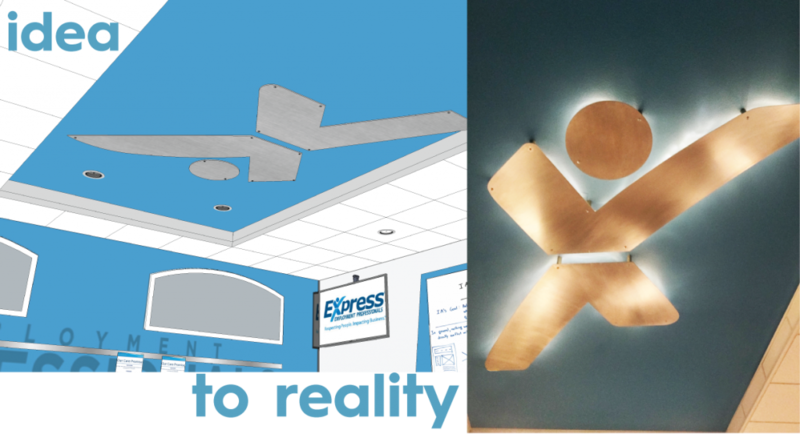 The Express Employment ‘running man’ logo was contour cut out of metal and suspended from the drywall ceiling with rope lighting above. How about that for “wow factor”! 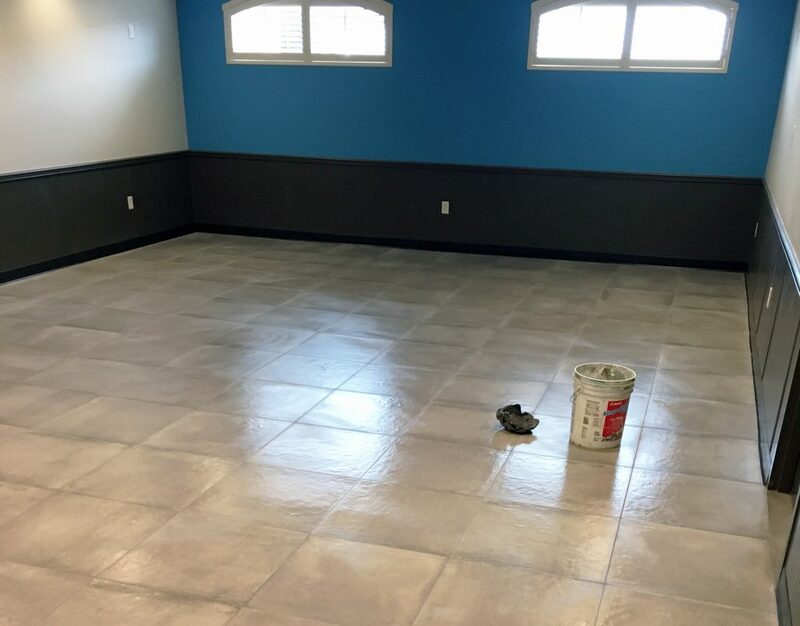 Although polished concrete was the original flooring choice, we opted for Eleganza 24” x 24” Alive tile after considering the amount of traffic the space would get each day. To create the seamless concrete look we wanted, we used a minimal grout line when installing the tile. 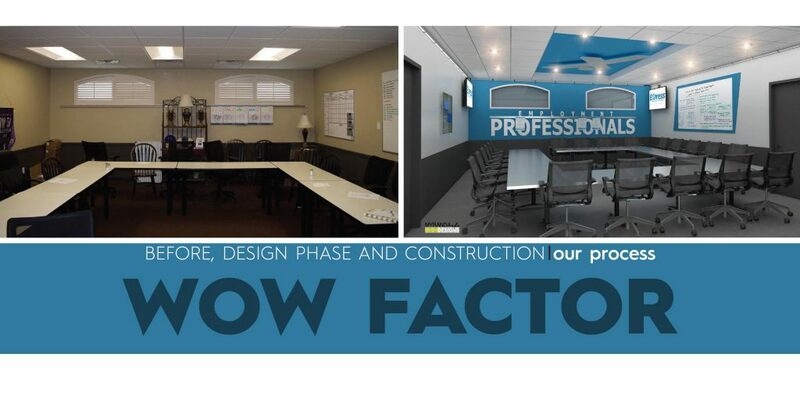 Getting to know the sales team proved incredibly helpful, as I designed the signage based on their goals. Sticking to the monochromatic vibe, I utilized a mix of gray vinyls and dimensional, acrylic letters to make the signs really pop on the space’s main walls. 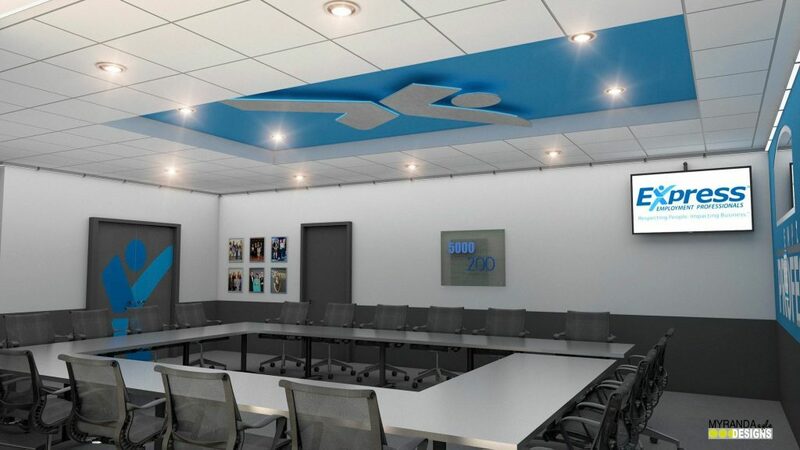 Additionally, I used an oversized graphic to compliment the major blue focal wall. 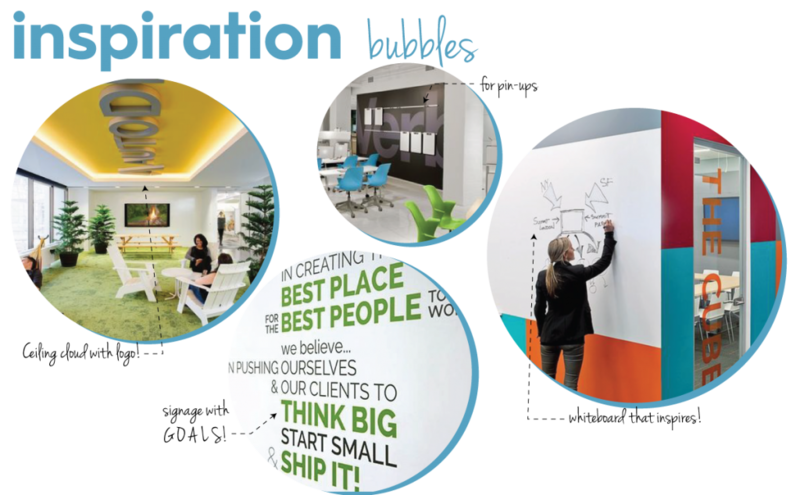 Once the magnetic strip is used to display the team’s ideas, the signage will act as a super cool backdrop, a funky statement that makes the space feel anything but ordinary. In a stroke of genius, we salvaged the current tables by removing the tops and replacing it with a stainless steel veneer. 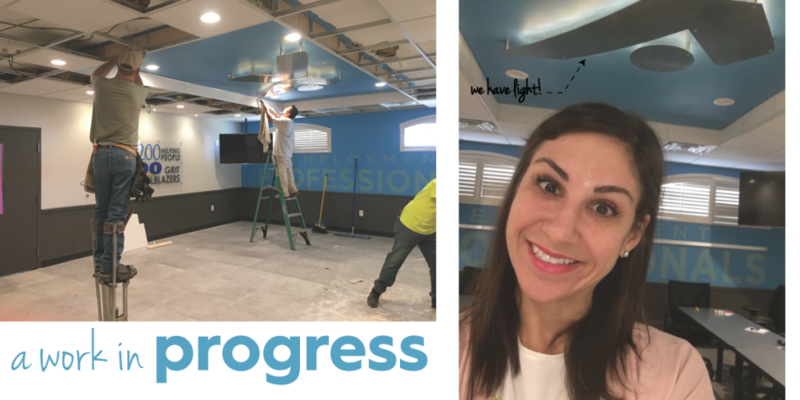 To create the look of a recessed ceiling, we removed an 8’ x 16’ rectangle in the lay-in ceiling and brought it up to meet the drywall ceiling above. This new space is the perfect spot for the logo-inspired ceiling cloud, which creates soft lighting thanks to the contoured rope lighting. 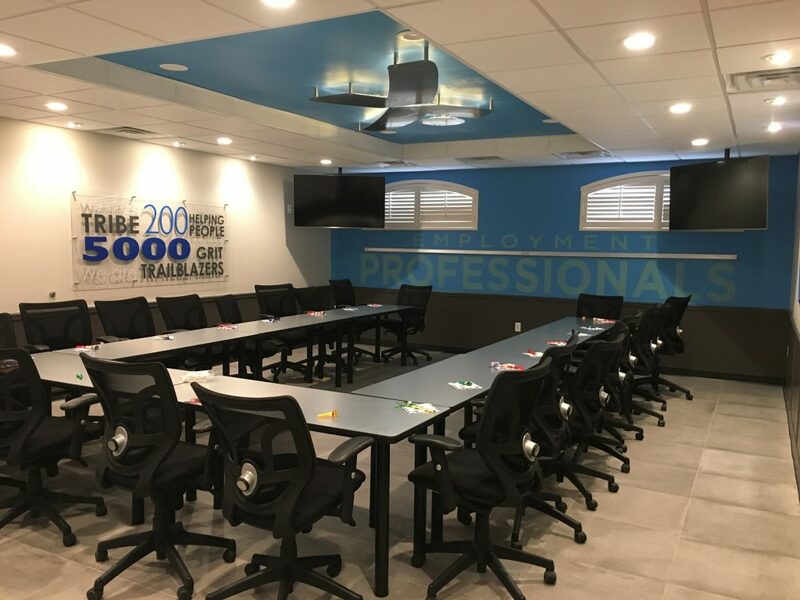 A true testament to creativity, Express Employment Professionals were a pleasure to partner with on this exciting project. Thanks to the partnerships on this project!